Get the ultimate machine of fun by buying the 49.9cc Power in black. This amazing gas go kart is perfectly built for both kids and adults alike and is guaranteed to provide great entertainment. Great for on road and off road terrains. 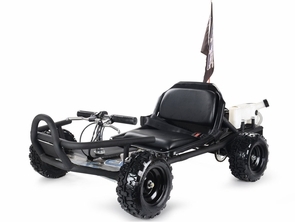 This astounding gas powered go kart uses the dependable 2-stoke 49.99cc engine, which is completely EPA compliant and is made of the very best materials. Excellent grip quality in your turns and superior stability at high speeds is a given, as the real rubber racing wheels mounted on aluminum mag rims are of the very best grade. Super high ground Clearance of 9 inches allows you to driver over most obstacles. The strong axle-mounted vented rear disc brake and high-tensile frame further compliment the superior design of this kart and enable it to reach speeds of 30+ mph! Buy this awesome product today and have the driving experience of your life. Holds up to 200 pounds. Yes, we carry all spare parts just in case so you will have fun for years! Buy today and we will also include a free safety flag that can be mounted on the rear of the kart for increased visibility! My grandkids love this toy! Very glad I found it.